Cooling Measures: What are the experts saying? Investing In A UK Property: What’s your strategy? Real Estate 101: What are property yields? What Are Singapore’s Latest Property Cooling Measures? What is the importance of share value? What Exactly Affects Real Estate Prices? Why The Craze Over En Bloc Sales? Renovation Guide: Looking For A Robot Vacuum Cleaner? Kitchen planning: What should go where? Renovation Guide: In need of sound advice? In Singapore, there are quite a number of major banks that offer attractive interest rate packages for your financing needs. How does OCBC compare to the other major banks when it comes to home loans? Since October 2017, OCBC has dropped the OCBC Fixed Deposit Monthly Rate (FDMR), which is their fixed deposit-linked home loan rate, and created a new product called the new OCBC Home Rate, or OHR. Borrowers may be confused with the introduction of yet another acronym. How is OHR calculated, and should u consider taking up the OHR? The OHR benchmark is a rate that’s managed directly by the bank. One unique feature is that the OHR offers customers a free switch if OCBC Home Rates were to shift upwards. How this helps is that if OHR increases to a rate that you do want to pay for, you can negotiate with the bank for a new-OHR package at no cost. This means that repricing fee is completely free. Another feature that gives customers flexibility is that they can prepay 50% of their loan during the 2-year lock-in-period for completed properties without penalty. However, the OHR is ultimately still a board rate. The final decision on how the OHR is calculated still lies entirely on the bank itself. If you do a quick search around the internet, you may find that OCBC has not publicly announced how OHR is calculated exactly. They thus have the right to alter the definition of OCBC Home Rate anytime. OCBC will also give a 30-days’ notice if it is going to change it’s OHR. While OCBC previously offered 3 sets of FDPR, the FDMR15, FDMR38, FDMR48, it has been replaced by the OHR packages. OCBC also does not offer fixed-rate packages, with packages having a certain lock-in period. For HDB loans, OCBC offers full legal subsidy for loan amounts $300k and above for refinancing. Interestingly, OCBC is currently the only bank that allows this! Subsidies are offered up to $1,500 upwards. This is however subjected to change. Equity loans help you tap into the value of a fully-paid for property. For equity loans of less than 50%, OCBC are less stringent for loan application. OCBC allows a bridging loan for the deferred payment scheme. OCBC currently has no mortgage interest rate caps. This may prove to be a downside for customers, as they are not protected against great jumps in interest rates charged. An interest-offset mortgage account is linked to the mortgage loan you take up, and is essentially a savings/repayment account. It allows customers to enjoy a higher interest rate that matches your housing loan package. OCBC has no interest offsetting feature for its loan package. OCBC offers the flexibility of allowing customers to use their own existing account as repayment account. Funds do not have to be deposited with OCBC prior to loan disbursement. As part of Singapore’s cooling measures, the same Total Debt Service Ratio (TDSR) and Monthly Servicing Ratio (MSR) applies. While TSDR applies to all home loans, MSR affects only loans for HDB and Executive Condominiums (EC) and their refinancing. OCBC recognizes customers who are self-employed as salaried workers. This allows customers such as private tutors and freelancers to secure a loan. For part purchases, OCBC does not require you to use a designated lawyer, as long as the lawyer is in the bank’s panel. On 9 May 1989, OCBC revamped its logo and changed its name to OCBC Bank, thus giving the bank a new corporate identity. OCBC Bank has expanded itself over the years through mergers and acquisition in markets such as Singapore, Malaysia, Indonesia and China. OBCB Bank today has positioned itself as the second largest banking group by total assets in Singapore. It has also diversified it services beyond just banking, to offering other financial series such as asset management, and also brokerage. It is always important to consider a combination of different factors before choosing home loan. If are unsure, you can always check with our trusted mortgage advisors to guide you through the loan selection process! The post A guide to OCBC Home Loan Interest Rates in Singapore appeared first on Redbrick Mortgage Advisory. Meet Redbrick’s New Celebrity Ambassadors, Pierre Png and Andrea De Cruz! Property Quotient aims to be the leading content platform for all things related to real estate, personal finance, and home ownership. How To Make Your Home Look Expensive Without Spending A Lot? @2018 - All Right Reserved. Designed and Developed by Redbrick Team. 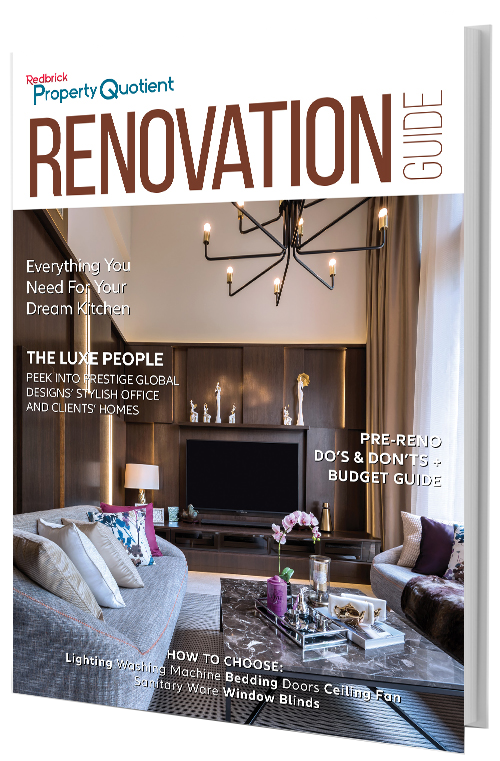 With over 80+ pages of content, the Property Quotient Renovation Guide is the most comprehensive guide you'll need before commencing your renovation works.